I’ve teamed up with more than 55 fantastic cozy mystery authors to give away a huge collection of novels to 2 lucky winners, PLUS a Kindle Fire to the Grand Prize winner! 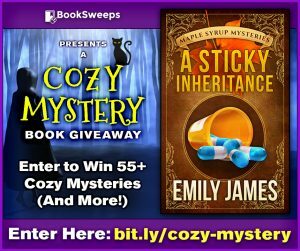 You can win my novel A Sticky Inheritance, plus books from authors like Dianne Harman and Vicki Hinze. Murder on Tap Now Available! 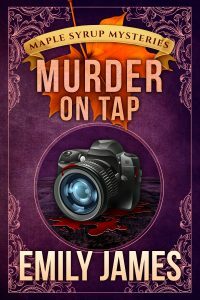 Murder on Tap (Maple Syrup Mysteries Book 4) is now available! Former lawyer Nicole Fitzhenry-Dawes thinks she’d be happy to spend her life making maple syrup and never take part in another murder investigation again. At least, she thinks so right up until the photographer she hired dies on the tour she’s leading and the main suspect is her friend’s niece, Holly. When Holly disappears as well, Nicole faces what looks like a locked-room mystery. One of the people on the tour must have committed the crime, yet none of them could have done it. To keep an innocent woman from going to prison, Nicole’s thrown right back into the midst of another hunt for a killer. 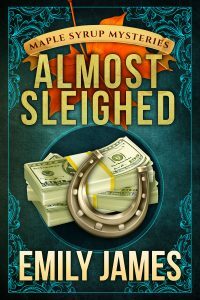 Almost Sleighed, the third book in my amateur sleuth cozy mystery series, is now available! Former lawyer Nicole Fitzhenry-Dawes has finally settled in to her new home in Fair Haven, and her first maple syrup season is upon them. It’s not going as smoothly as she’d hoped. Their sap lines keep springing leaks, and as if that wasn’t enough, Nicole finds their groom-mechanic, Noah, apparently trampled in one of the horse stalls. Fair Haven’s interim police chief is ready to declare it an accident, but Nicole believes otherwise. With Noah in a coma, she’s determined to figure out who wanted to kill him before the perpetrator can return and finish the job. But whoever attempted to kill Noah has other ideas and is willing to do whatever it takes to stop Nicole from discovering the truth—even destroy Sugarwood and the man Nicole loves. 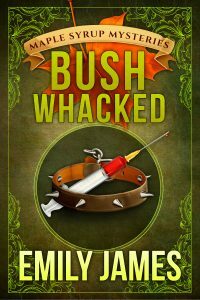 Bushwhacked, the second book in my amateur sleuth cozy mystery series, releases today! Former lawyer Nicole Fitzhenry-Dawes has packed up her life in Washington, DC, to move to the tourist town of Fair Haven, Michigan, and take over the maple syrup business she inherited from her uncle. But trouble seems to find Nicole wherever she goes. Caught in a snowstorm on her way into town, she hits what she thinks is a deer. It turns out to be the manager of the local animal shelter, and the collision isn’t the primary cause of death. Feeling guilty anyway, Nicole convinces the interim police chief to allow her to help with the case, even though she’s also busy trying to settle in to her new role as owner of Sugarwood and figure out her unusual friendship with the county medical examiner. As Nicole closes in on being able to put the killer behind bars, will she manage to find the evidence she needs before the murderer puts her in a cage—or a body bag—instead? 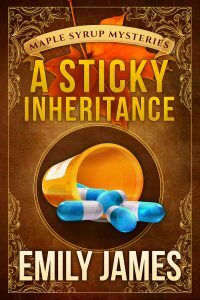 A Sticky Inheritance Now Available! A Sticky Inheritance, the first book in my amateur sleuth cozy mystery series, releases today! For the first week, you can grab it for 99 cents on Amazon (or you can borrow it if you’re part of Kindle Unlimited). Nicole Fitzhenry-Dawes feels like she’s the only failure amid a family of high achievers. Her last serious boyfriend turned out to be married, and her career as a criminal defense attorney is in tatters. When her uncle passes away and leaves her his maple syrup farm in Michigan, she thinks it might be time for a career change—hopefully one that allows her to stay as far away from murderers and liars as possible. For half a day at least. Her uncle’s suicide quickly begins to look like it wasn’t a suicide after all, but the chief of police is reluctant to investigate and soil the reputation of his serene little tourist town. Murder’s bad for business. Nicole has no choice but to search for the killer on her own, with a little help from the handsome county medical examiner—who’s exactly her type and all wrong for her.